What is winter for motorcycle riders if not a time for catching up on motorcycle books? Here’s a selection of moto reading to entertain and inspire us for the not-so-far-away riding season. If you’re looking for more, check out my link at the bottom. I heard Dylan speak at the Horizons Unlimited event in Virginia last April and his story is awesome in every sense of the word. 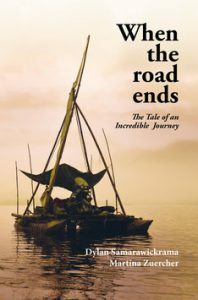 This story may be the most unusual and incredible motorcycle journey you will ever get to read about! 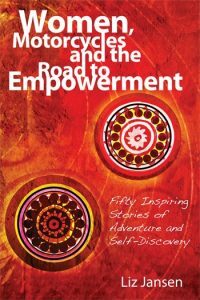 It is inspirational, funny and moving, and has the quality to take you on an adventure. As a young child, Dylan often daydreams of adventure and yearned to travel the world. However, growing up in Sri Lanka, facing extreme poverty and many hardships, his dream seemd as impossible to reach as the stars in the night sky. Yet, despite all the odds, and many years later, Dylan literally rides around the world on a motorcycle which he affectionaltely calls Bruce. After 130’000 miles, four continents and three years later, he finds himself in Panama where all roads suddenly end. Undaunted, Dylan builts a raft atop ten oli barrels, powered by his motorcycle and a tiny sail and ventures out across the Pacific Ocean to reach Columbia. And as you would expect, things do go wrong. But luckily for Dylan there are Dolphins … One of the most authentic and incredible adventures ever. “A true story told in an outstanding quality.” – Swiss National Radio and Television. Originally published in German as “Am Ende der Strasse”. Lois’s latest book has just been released in the U.K. and the Amazon.com page says it will be available February 21, 2017. Her first two books were highly engaging and lively, written with her distinctive perspective and style. 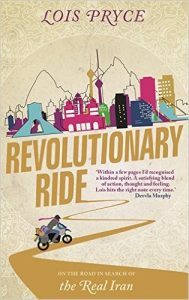 “Revolutionary Ride is my third book, about my travels in Iran. 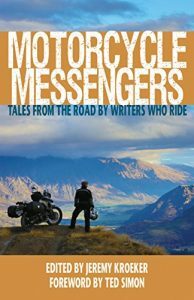 “Motorcycle Messengers is a collection of travel stories from some of the leading writers in the genre . . . plus a few people you’ve never heard of. Consider it a sample pack of authors. Read a story by the fire and discover your new favourite motorcycle travel writer. Lois Pryce exploits her dead grandmother and an imaginary husband to access the Congo. Neil Peart finds his rhythm through the curves of North Carolina. Paddy Tyson numbs his fear of crocodiles with a few drinks in Australia. Carla King rides with a screaming, doped-up trucker in China. Sam Manicom is forced out of country by the military in Sudan. Geoff Hill breaks a Royal Enfield, falls in love, and becomes a hookah hooligan in Iran. Jeremy Kroeker yearns to slap a rain gear designer in Slovenia. Ted Bishop tricks himself into one final ride through the United States. Mark Richardson puts his foot up and makes connections in Rwanda. Jordan Hasselmann stares down the barrel of a wooden gun and possibly a real one, too in Guatemala. Christopher P. Baker nearly crashes as he crushes crustaceans in Cuba. I discovered this book while researching an article I was writing about Adeline and Augusta Van Buren, who grace the cover. Last summer I was honored to participate in the Sisters Centennial Ride, celebrating 100 years since the gutsy sisters became the first women to ride their own motorcycle across the continental U.S. These women were pioneers in many ways and paved the roads, metaphorically speaking, we enjoy today. 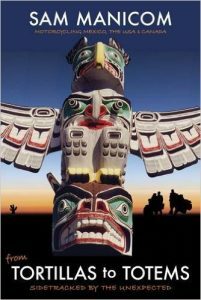 Sam Manicom’s fourth book is a gripping rollercoaster of a two-wheeled journey which takes you riding across the dramatic landscapes of Mexico, the United States and Canada. This enticing tale has more twists and turns than a Rocky Mountain pass and more surprises than anyone would expect in a lifetime. There are canyons, cowboys, idyllic beaches, bears, mountains, Californian vineyards, gun-toting policemen with grudges, glaciers, exploding volcanoes, dodgy border crossings and some of the most stunning open roads that a traveller could ever wish to see. Because I had to include this one too! I’ll let this Amazon reader review speak for itself. Looking for more moto books? 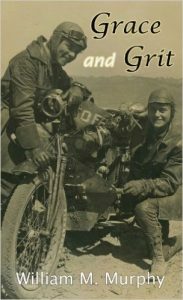 Read my earlier post 10 Moto Book Gift Ideas.